These colorfully illustrated, state-specific charts show what foods are in season throughout the year. 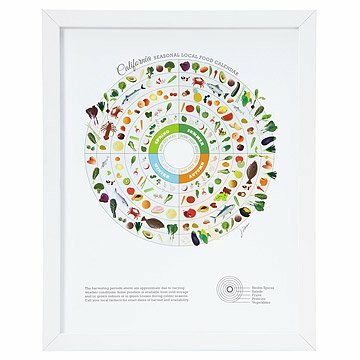 Delectable kitchen decor, these graphic calendars are also great references for cooks who like to focus on what's in season. Like a mandala of the seasonal specialties from your choice of 13 different states, they demonstrate amazing regional bounty for farm-to-table menu planning--just glance at the graphics before heading off to your weekly farmer's market. Made by graphic designer Jessica Haas, who did her thesis project on how design can be integrated with public health policy to decrease and prevent childhood obesity. Designed in New York City. Printed and framed in Portland, Oregon. click here to see all available states. Jessica Haas has two passions: design and health. While pursing a Masters degree in graphic design, she wrote her thesis on how design can be integrated into the cure and prevention of childhood obesity, which became the inspiration for the products you see here. Jessica offers an inventive and artistic perspective on the way you think about food and help bring home the freshest foods for you and your family. Framed print is ready to hang with wire hanger. Unframed print is wrapped in tissue and shipped in a tube. I am going to hang this in my kitchen as a reminder to myself to buy seasonal! This is such a lovely reminder and so informative. This is a very well made, colorful informative picture. I paired it up with the other Uncommon Goods pictures of Betts, Carrots and Tomatoes, looks great together.